The Electro Breeze commercial air purifiers have earned great experience in retrofitting several large commercial and government buildings with new air cleaning solutions. Electro Breeze offers an air cleaning system to building managers and engineers for older buildings that have indoor air pollution problems or for installation into your new building construction. Electro Breeze high efficiency commercial air purifiers are powerful and effectively trap harmful airborne pathogens; bacteria, viruses, SARS, Anthrax, Tuberculosis, mold spores as well as dust, pollen, dirt, tobacco smoke, odors with activated charcoal filter pad. The Electro Breeze V-Bank commercial air cleaners are a revolutionary design to appeal to commercial and institutional clients who operate large buildings and want to reduce energy usage of their air handling systems. Installing V-Banks significantly improves energy savings by reducing static operating pressure. 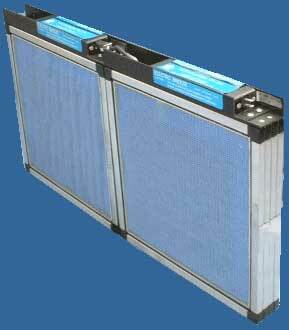 The V-bank system with the Electro Breeze Air Cleaners installed perform at HEPA efficiency on multi-pass filtration. Electro Breeze Air Cleaners have a very low pressure drop and as such will provide significantly improved energy savings, plus filter replacement savings over conventional filter systems. Installations in large buildings, casinos, hospitals, universities and office towers have proven the cost effectiveness of the Electro Breeze V-Bank industrial air purifier. 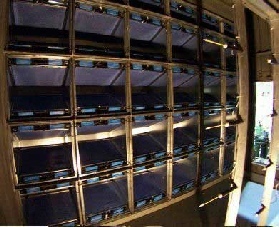 Several unique technologies converge when using the V-Bank filter system resulting in increased air flow, greatly improved filtration efficiency, reduced energy costs, and healthier occupants. 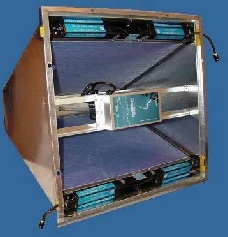 The V-Bank assembly is available now for your office air cleaner system. Assembly on site in minutes with easy to follow instructions and all the necessary parts included. Installing the optional Ultra-violet germicidal system kills germs, bacteria and viruses while the Electro Breeze air cleaner panels collect the particles they ride on.